This was the only beanies buddy that I had to find in the city! 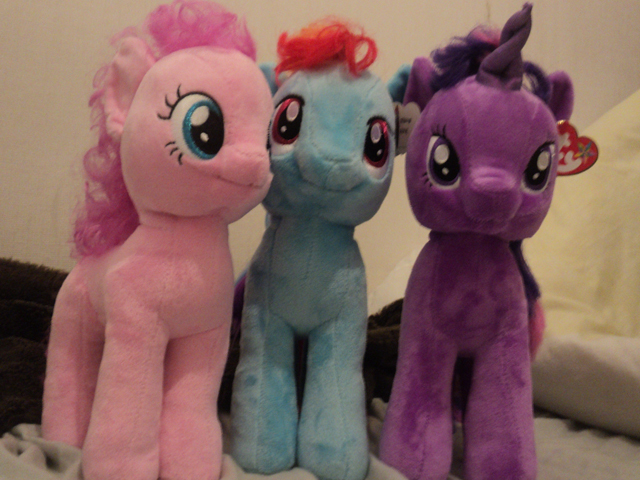 T_T on the first day I found one for £15 (I paid £10 for the others). Luckily on the second day I found it sitting in a window for £12. I would never recommend buying beanies online (you need to be able to look at them). 1. texture of the sewn tag. 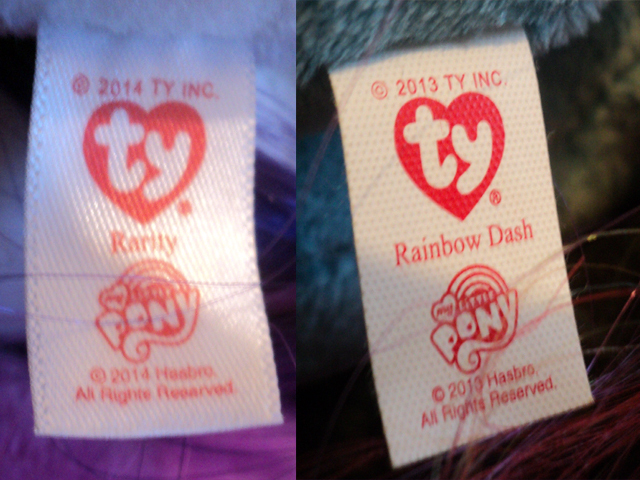 only the original twilight, pinkypie and rainbow have a paper like tags (all ponies made in 2014 have silk tags). 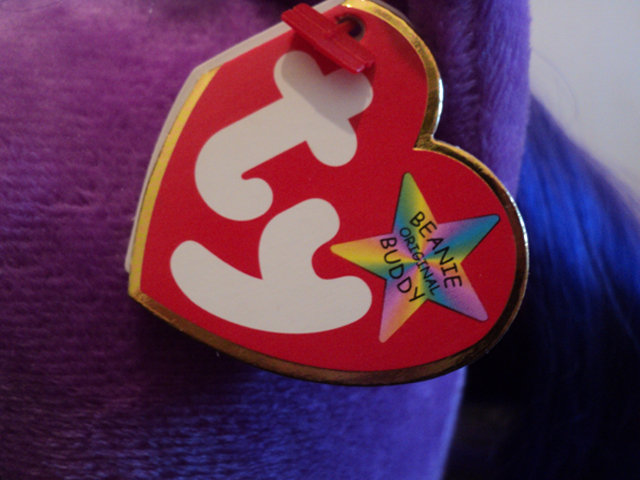 2.These beanie buddies have a star on there tag. 3. 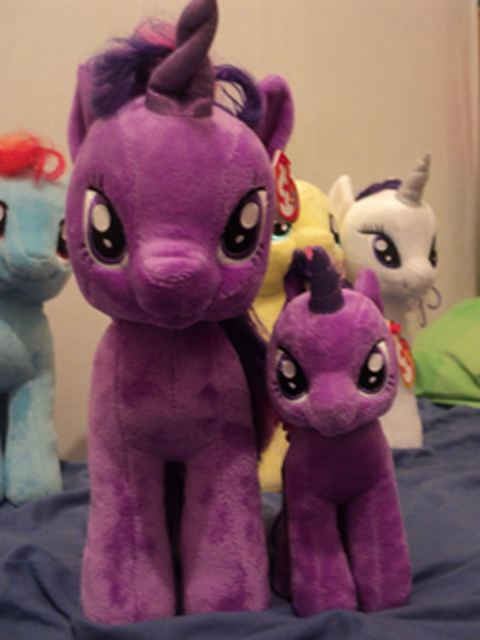 The 2013 buddies seemed to have a fat necks (this was removed in the 2014 ponies). The owner of the shop is debating if it was worth getting one for display. its hard to grasp how big the xl are. My first sense of panic arose when i saw the amazon image for this thing. o-o i don’t know which one is worse??? The one on the amazon image might look bulky but at least all of it limbs look level. 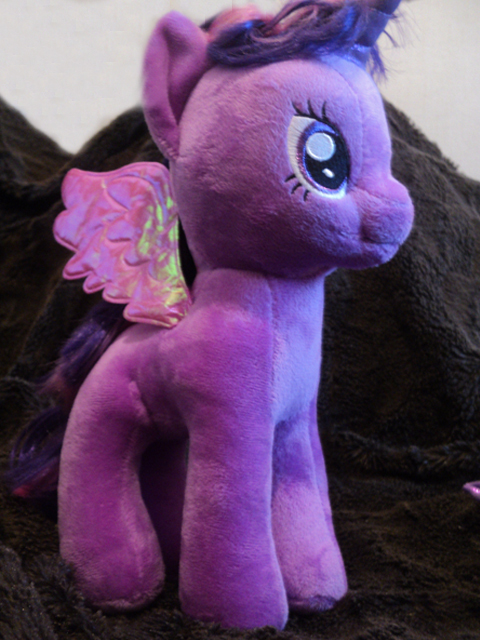 The twilight I got seems to have over stuffed back legs and a strange hard patch underneath the cutie mark (feels like heavy amounts of hard glue). 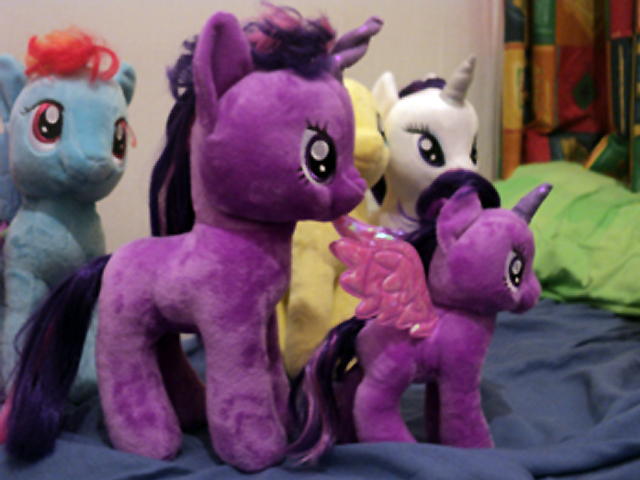 non of twilight’s legs are actually level in fact, if you try and stand her strait it look like she is taking a pee. The tail and the back of the hair hangs perfectly however, for some odd reason her fringe sticks up like a crazy Mohawk. 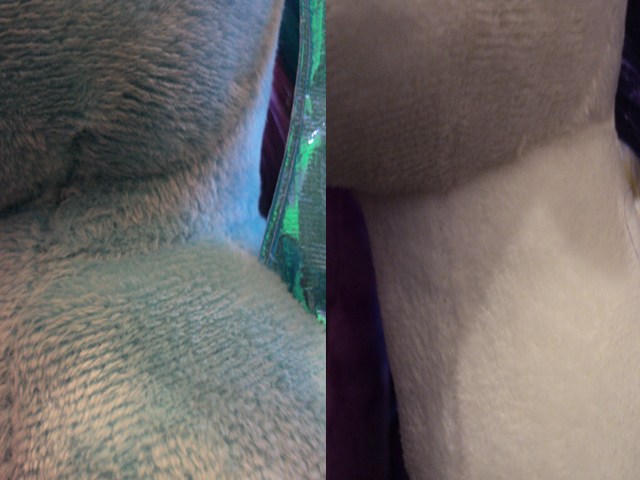 The horn will not stand strait no matter how much a bend it to the left (its glued in place). 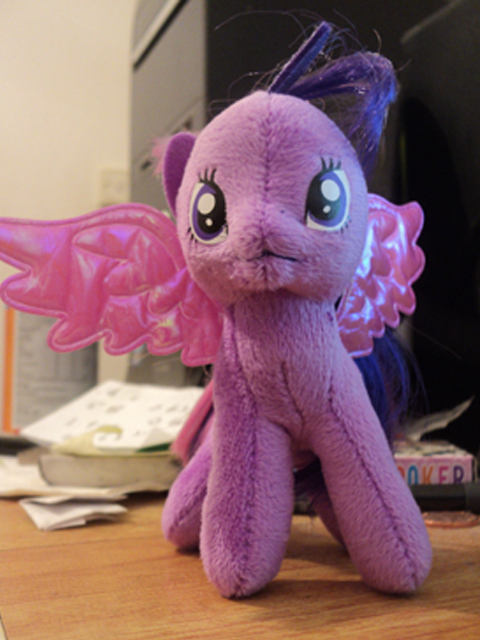 O_0 I will hang this deformed creature on my bag. 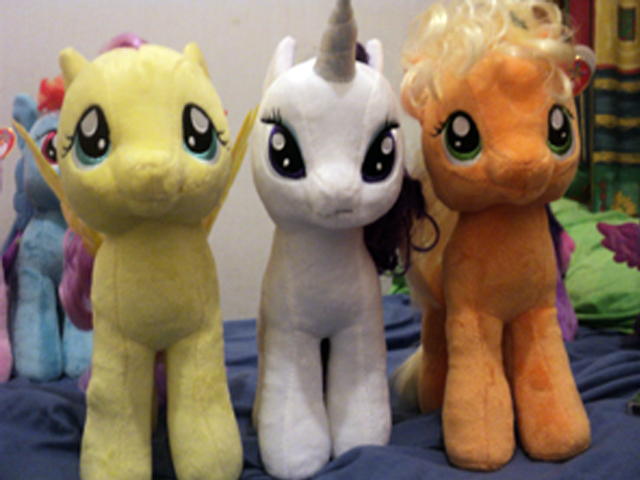 T_T Might get another just for collection purposes. p.s. This beanie has no beans. i promise that the next post will be more anime related. 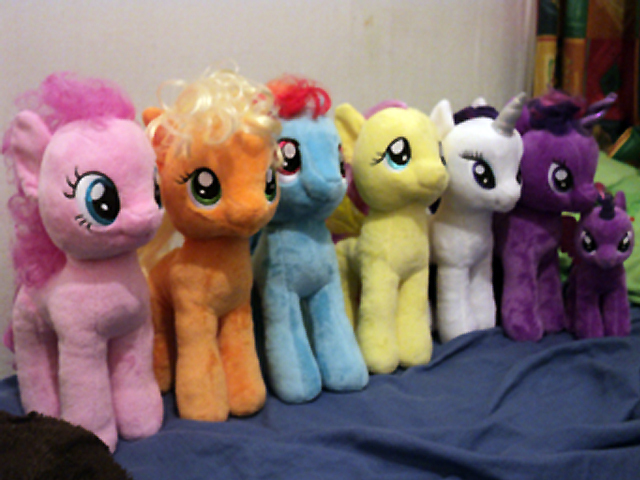 ^_^ I finally have the entire collection (came in today). 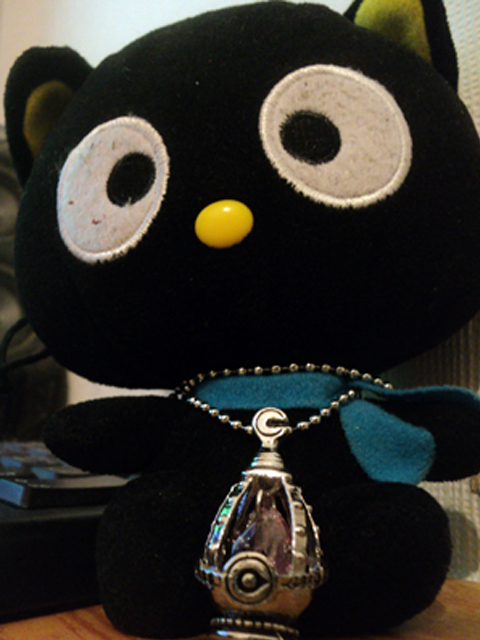 Guess what i have been collecting? i had to embarrassingly ask the lady at the till when they were getting the new beanies in. me: Nar, I will just wait until they’re in the window. Is it alright to have a dementia joke in a cartoon aimed at children???? ?